Congratulations to everyone in our team who reached the top of Cho Oyu, 6th highest mountain in the world and perhaps the best possible preparation for climbing Everest. Thanks to all of the members, Sherpas, and leader Dan Mazur for their strong efforts. We were very lucky with perfect weather and that we were able to have a perfectly planned schedule and great weather forecasting technology available, including a very helpful and experienced staff and leadership team. 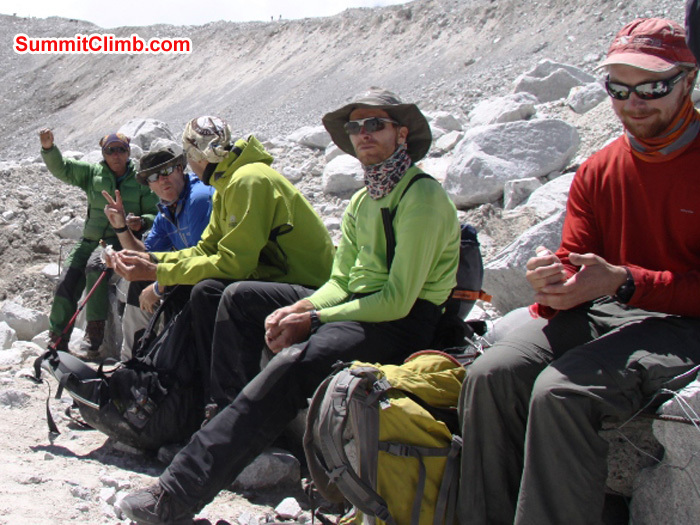 Our own Sherpa team fixed much of the ropes to the summit. After climbing Cho Oyu, our next plan for our team is to climb Mount Everest, the highest mountain in the world, during April and May . 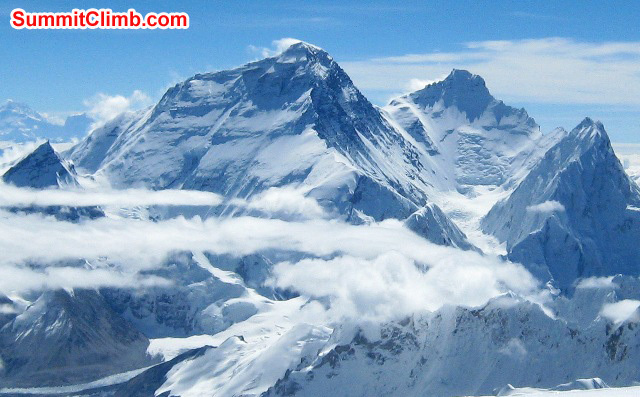 We have two expeditions, one from the Nepal side of Everest and the other from the Tibet side of Everest. 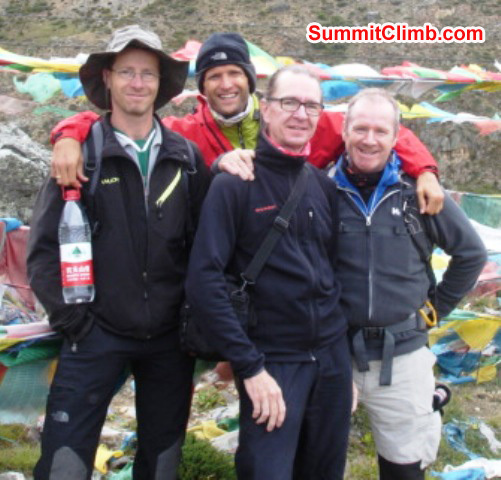 Please come and join Dan Mazur and our top Sherpas for our 12th Everest expedition. Bookings are being accepted now. Changtse, Everest North Ridge, Lingtren, Pumori, Everest South Col, Geneva Spur, Lhotse, Western Cwm, and Nuptse, seen from Cho Oyu Summit. Photo Matti Sunell. Dan Mazur on the summit. Photo Juergen Landmann. Matt Olsen on summit morning. James Grieve Photo. Matt, James, and Jangbu with the Flag of Scotland on Cho Oyu. Matti Sunell Photo. Looking down from camp 3 to camp 2, camp 1, abc, and the vast sweep of the Gyebrag glacier below. Jangbu Sherpa Photo. JJ crossing the vast summit plateau of Cho Oyu. Matti Sunell Photo. Dan abseiling down to camp 3 in a blizzard. Juergen Landmann Photo. Dan climbing to the summit with camps 3, 2, 1, Abc, Bc, Gyebrag glacier, and Mount Shishapangma in background. Juergen Landmann Photo. 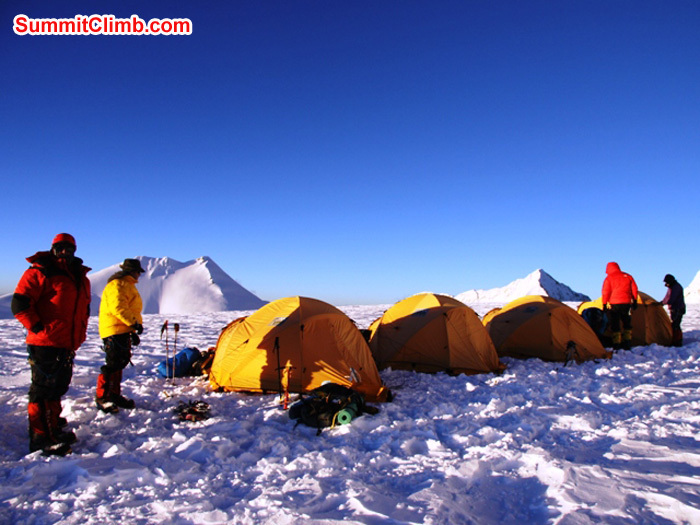 Today we left camp 3 at around 1:50 am and reached the summit between 9am and 11am, then after summitting. went down to camp 3, and then down again to camp 2, where we spent the night. As expected, the summit plateau was long and challenging to cross. It took the most out of the members. The members who chose to use oxygen were stronger and faster, and had their wits more about them. 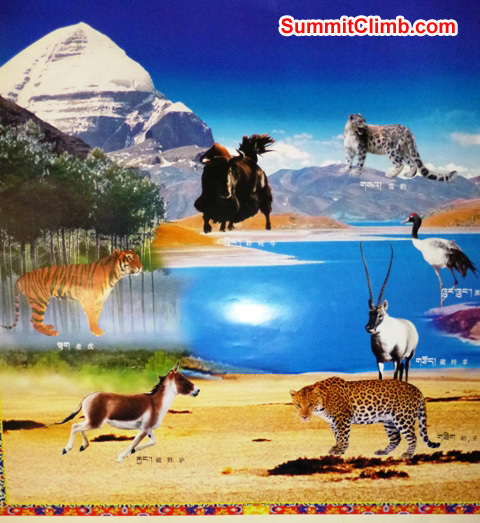 The members not using oxygen claimed to experience some hallucinations due to the hypoxia which accompanied them throughout the summit plateau hike. One member imagined he was arriving at a tourist centre. Another thought he saw animals morph out of the snow. One member confused empty oxygen bottles stuck in the snow with a fellow climber. Our earliest summiters got a rare view of the Everest massif and the many high and sharp peaks on the Nepal side. It takes a few minutes when you walk across the summit plateau to realize that you really are seeing Everest, Lhotse and Nuptse, so unusual is the viewpoint. 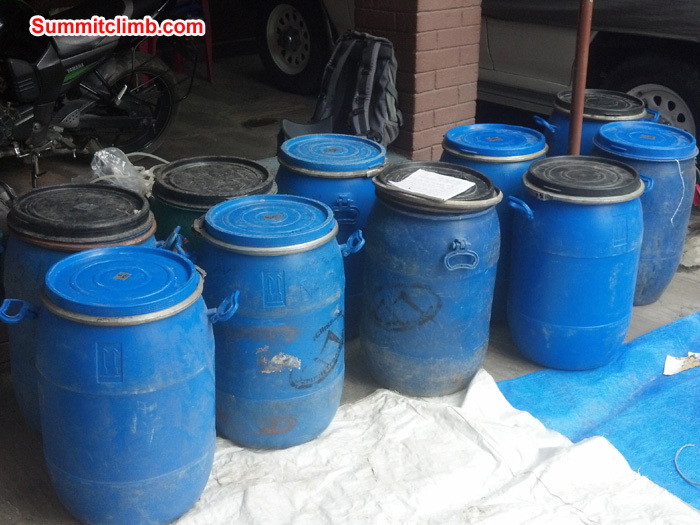 Cho Oyu team has returned safely to C2. It was tough going down from summit. Was it a blizzard? Yes. Was it exciting? Yes! 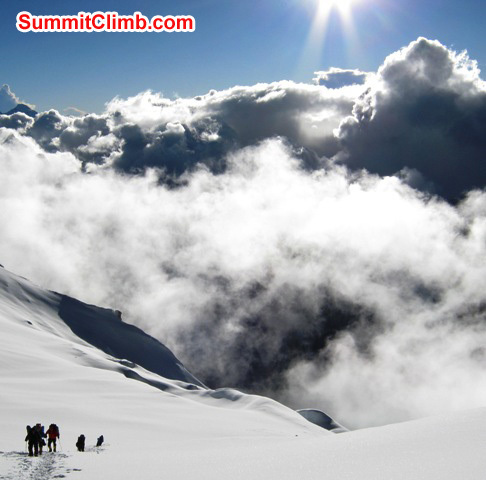 SummitClimb team now standing a top Mount Cho Oyu. Warm with light wind. Starting to snow, time to descend! Climbers just below the summit plateau early in the morning. Juergen Landmann Photo. 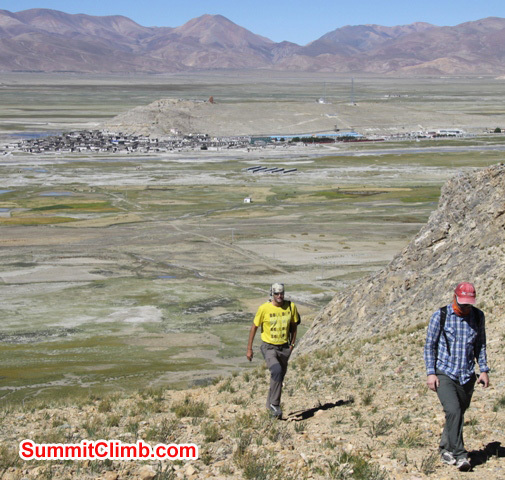 Dan and Juergen Landmann with Tibetan Plateau in the background on summit morning. Juergen Landmann Photo. Looking out across Tibet on summit night. Mount Shishapangma in upper left, Mount Jobo Rabzang in lower right. Juergen Landmann Photo. JJ climbing to the summit. Juergen Landmann Photo. Today we woke up and had a sunny morning breakfast, then Jangbu Sherpa and Ang Pasang came down from preparing the route to the summit and together we packed up everything and climbed up the steep hill from camp 2 to camp 3. Upon reaching camp 3, we set up tents on the steepish snow slope in a terrace-wise fashion, then started melting snow and getting ready for a midnight wake-up and start. We are in camp 3 @ 7500 mtrs / 24,000 ft. Heading for #summit @ midnight. Calm, no wind. Wish us luck! 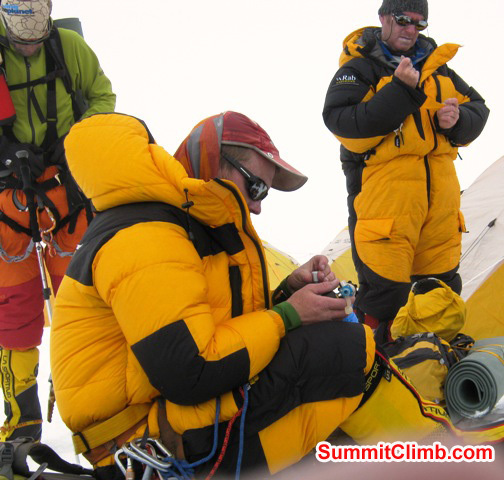 SummitClimb's Cho Oyu team is now in camp2 @ 7100 m / 23,000 ft. Going for camp3 and summit 2nite. Watch us! Written by Juergen Landmann: Tag 25, 7.00 wecken, etwas essen gegen 8 beginnt das Aufstehen. Die Sonne scheint, aber es ist eisig. Die Steigeisen anderer knirschen draussen vorbei. Wir brechen bei wechselhaftem Wetter 9.45 auf mal schwitzt man mal ist fast die Daunenjacke zu kalt. Die Steilstufe am Seracabbruch kennen wir ja schon, die stellt heute auch keine groessere Schwierigkeit dar. C1.5 ist leer, weirer im Rechtsschwenk auf "Jangbus Way" nach oben. C2 auf 7180m erreichen wir mit Sonnenuntergang. Schlagartig ist es arschkalt und einige sind nicht mehr in der Lage, die Zelte aufzustellen. Aber wir sind ja ein Team! Ploetzlich wieder die Meldung: Wir duerfen in stehende Zelte, nicht schlecht! Also unsere eigenen wieder einpacken und "haeuslich niederlassen"
Hot Shower tent in advanced basecamp, Cho Oyu summit in background. Matti Sunell Photo of Juergen. Juergen Landmann takes a break while abseiling down to camp 3. Juergen Landmann Photo. Climbers onthe slope from camp 2 going up to camp 3. Matti Sunell Photo. Today we walked from camp 1 to camp 2. Having been to camp 2 before, on ropes fixed by our own Sherpas, we knew it would be a long walk. 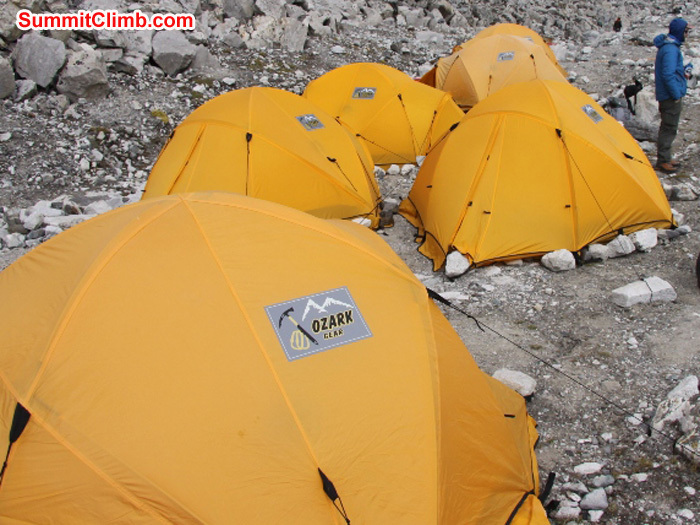 When we reached camp 2 we went to sleep immediately. The weather was good. During the night, two of our Sherpas, Jangbu, and Ang Pasang, joined forces with 2 Sherpas from another group and fixed ropes to the summit at 4am. 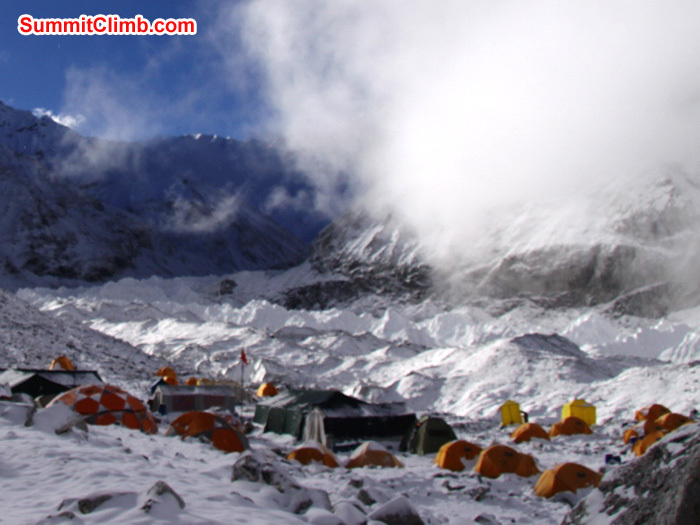 After 3 days of rest in ABC, we are back up high again, in camp 1, and headed for camp 2. Please wish us luck! Written by Juergen Landmann: Tag 24, nachdem wir 3 Tage im ABC mehr oder weniger geruht haben, sollen wir uns ab heute wieder mehr bewegen. Zu meinem Erstaunen hat irgendwer schon mal das Fruehstueck um 20min vorverlegt. Als ich mich, noch halb steif, aus meiner Behausung pelle, steht der immer gut gelaunte Jimmy da und wollte mich eben wecken. Wir fruehstuecken reichlich wie immer, es gibt Porridge, Eier, Brot, Gebratene Wurst und Kaese. Es fehlt an nichts. Die Rucksaecke sind gepackt. 10.15 brechen wir auf. Dass es ernst wird, merken wir an den angezuendeten Raeucherstaebchen und an Jimmy. Der sitzt da und hat fuer jeden Opferreis parad. Wir nehmen ein wenig davon in die Hand und werfen ihn in Richtung Choerten, jeder fuer sich allein. Ich denke, jeder macht dabei irgendwie seinen Frieden mit dem Berg. Ich bitted arum, die Gruppe gut hoch und wieder runter zu lassen. Nacheinander umrunden wir den Turm aus Steinen und marschieren los. Bei 7Grad und stahlblauem Himmel finden wir einen guten Rytmus und erreichen nach 2h den Killerhang, schon wieder. Also hoch, dem staendigen Bombardement aller Kaliber ausweichend. Ziemlich fertig sind wir um 14.40 auf 6265m. Als es an Zelte aufstellen geht, kommt von irgendwo her die Nachricht, wireiner anderen Expedition nutzen. Sherpas machen so etwas praktischerweise untereinander aus, cool! Jimmy und Jangbu versorgen uns mit Tee, Keksen Wurst und Kaese, waerend wir uns fuer eine Nacht einigermassen einrichten. Predawn panorama showing Mount Cho Oyu on the left and unnamed peaks in centre and on right, across the Nangpa-La Pass. Photo Juergenn Landmann. Preparing to pack up camp 3 and descend in a blizzard after summiting. Juergen Landmann Photo. Mera, Numbur, and Kwangde Peak seen at sunrise on 26 September. James Grieve Photo. Juergen Landmann back home in ABC in his personal sleeping tent. Photos of his family on the wall over his shoulder. Juergen Landmann Photo. Dan hoists a yummy celebration cake baked skillful advanced basecamp cook Dorje. Juergen Landmann Photo. Path from camp 2 looking up to camp 3 and summit above. Matti Sunell Photo. Path from camp 2 looking up to camp 3 and summit above. Matti Sunell Photo. Time for a refreshing beverage in ABC. Juergen Landmann Photo. 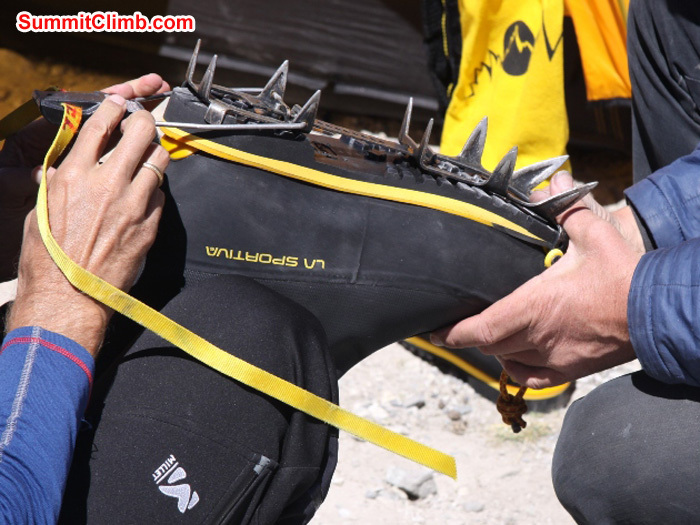 Hope Juergen's trekking boot makes the trip out ok. JJ Photo. JJ, Matt, and James preparing their kit in camp 2. Photo Matti Sunell. Jangbu and Dan putting up tents in camp 3 on summit night. Photo Juergen Landmann. Safely returned from C2 to Advanced Basecamp. All are ok. It's snowing and windy here. After 3 days rest, we hope to try for the top! Today we awoke to the usual sound of the morning "drums", let me explain, in the morning we have a light dusting of snow and ice over every tent from the snowfall during the night and the noise of a drum like sound can be heard as everyone tries to clear their tents from the inside and get rid of this unwanted cold ice and snow. 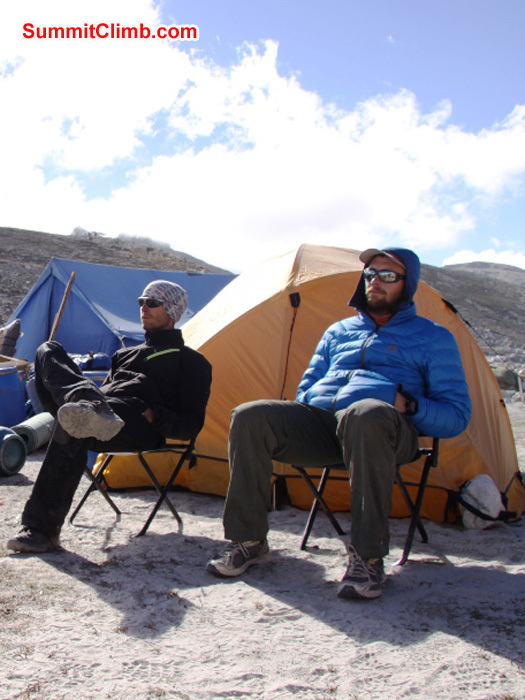 Then it is tea and hot water in our tents, helpfully supplied by our very good SHERPAS. After this we are summoned to the canteen by the cook where some delicious food has been prepared for us, such as pancakes, eggs, and so on. Truly for the altitude and the facilities that the cook has at his disposal then I must admit we have a great breakfast, lunch and dinner. After breakfast we are free to acclimatize at our own validation and we then we can have a lovely hot shower, (after so many days, week), I cannot tell you how good this feels. We shave, wash clothes, and fortunately the weather is on our side and we can hang our wet, washed clothing out to dry in the breezy yet very sunny air. Now that we are back in ABC, (advance base camp), we are able to SKYPE, check e-mail, and we are very fortunate to have these rest days. 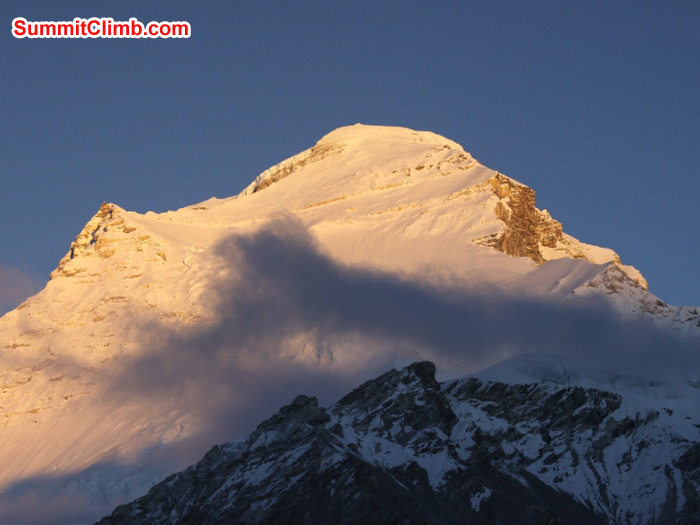 The whole team seems to be acclimatizing well, and off course our gaze is forever looking upward towards the CHO OYU and the summit or ultimate goal. Many teams pass our tents as we are resting and eating, they are heading to camp 2, where we have already been to, and off course we shall proceed there once again shortly. 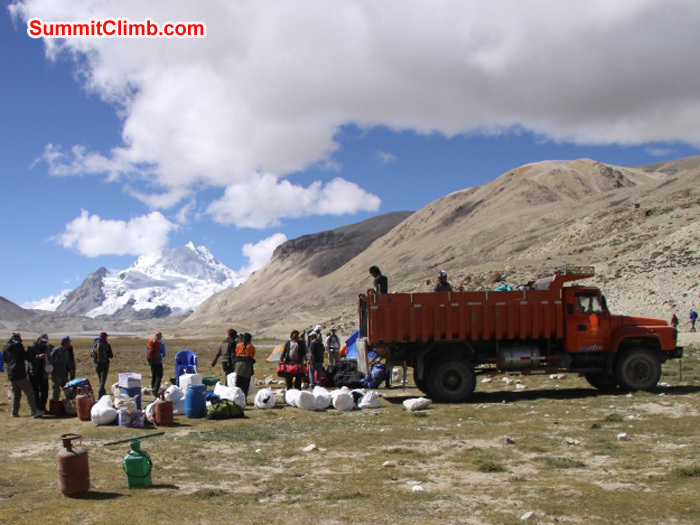 Thursday 19 September - camp 2 to advanced basecamp. This was to be the hardest day physically of the expedition so far. Our plan was to climb up to camp Two @ 7100 metres / 23,000 feet, leave a deposit of expedition equipment, to be used later and then descend all the way to ABC. We started the new route towards camp 2, steep at first, then more walking than climbing. During the day the clouds closed in, so we had only the little flags and footprints of a previous climber to lead us to the camp. 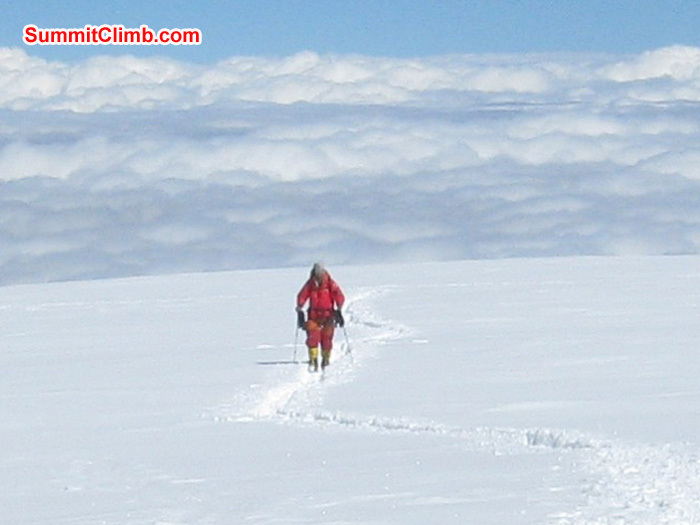 There are many false "final" slopes before the climber really arrives at camp 2. 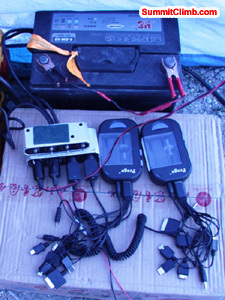 Ang Pasang and our team reached Camp 2 and made a cache of equipment, rope and snow bars. Photo by Jangbu Sherpa. Jangbu fixing rope up to camp 2. Ang Pasang photo. Golden sunset. super Sherpas Jangbu & Ang Pasang made route to C2 @ 7100m-23,000ft. Condolences to injured yesterday avalanche. Camped @ 6800 m / 22,000 ft. Light wind-sun-cloud. 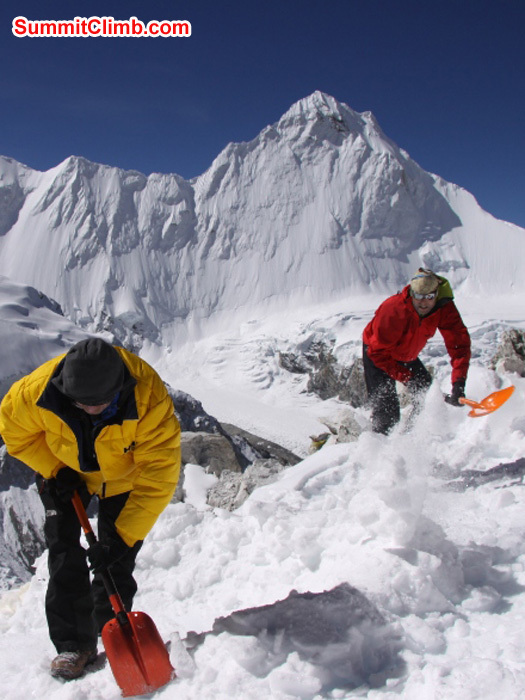 Sherpas from diff group hit by avalanche. We gave first aid. After the avalanche. 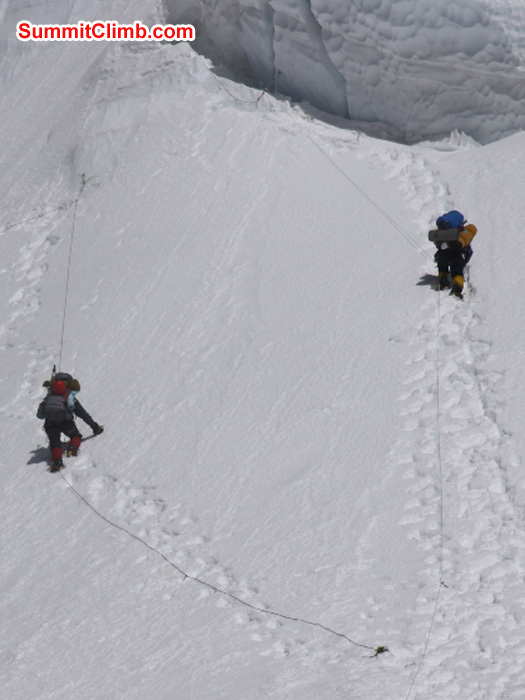 Injured Sherpas from a different group, helping one another descend down to camp 1. Jangbu Sherpa Photo. 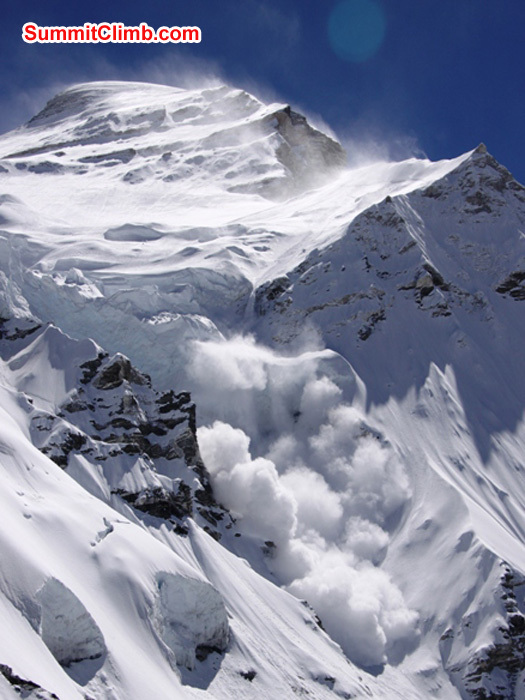 Avalanche sweeps down from Mount Cho Oyu. Photo Matti Sunell. 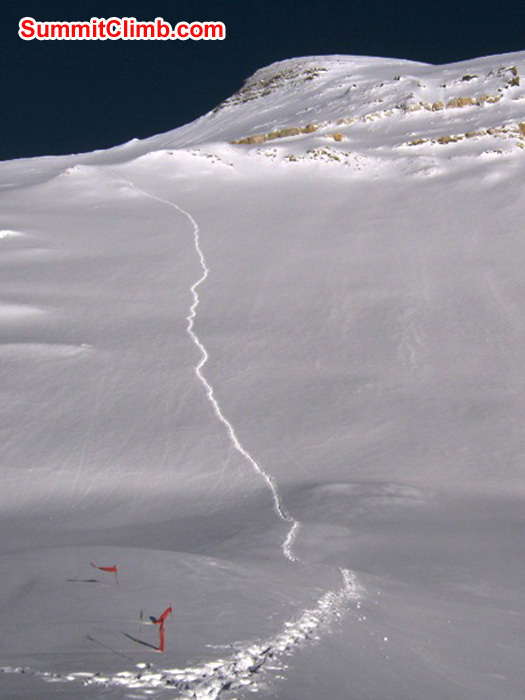 Avalanche tragedy above camp 1.5 . 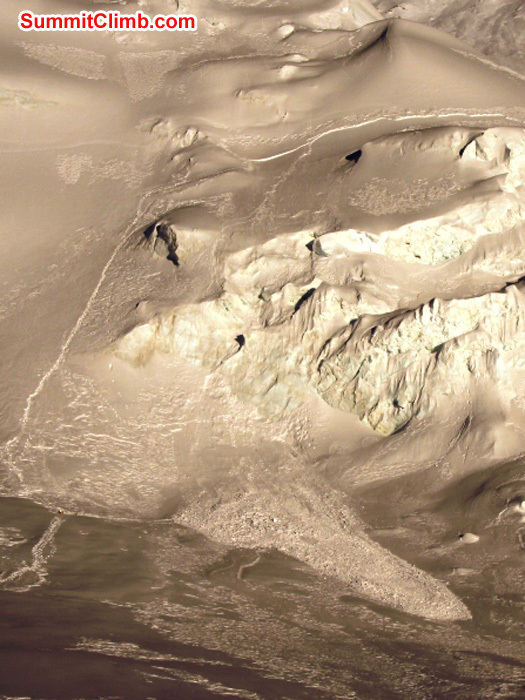 Climbers triggered it at the top f the photo and they were swept over the ice cliffs in the center. Photo by Matti Sunell. 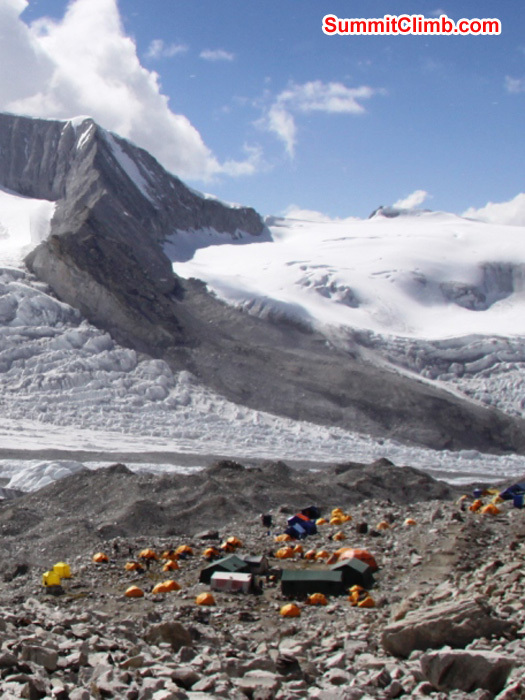 Wednesday 18 September - rest in camp 1.5 From camp 1.5 the route to camp 2 rises steeply to the right among seracs. Ang Pasang crests the last frozen snow wave before camp 1.5. Juergen Landmann Photo. climbing the ice step on the way to camp 1.5. photo by matti sunell. Camp 1.5. Photo by Matti Sunell. Helmets and iceaxes are required for this climb. James Grieve Photo. Hanging stove and boot in the vestibule of a comfortable two person tent in Camp 1.5. Photo by James Grieve. James Grieve climbing the ice cliff to camp 1.5. Juergen Landmann Photo. 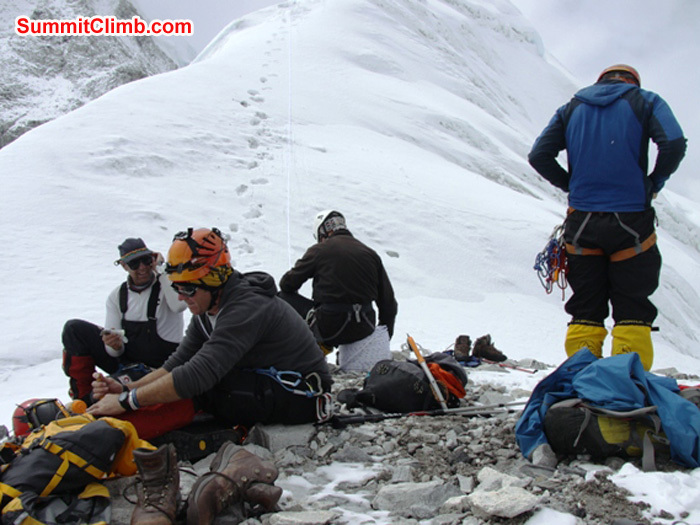 Our team climbs the ropes Jangbu Sherpa fixed above Camp 1. Jangbu Sherpa Photo. Jangbu Sherpa and Juergen Landmann waiting patiently at the base of the ice cliff just below camp 1. James Grieve Photo. Juergen ad James, eating breakfast in camp 1.5. Juergen Landmann Photo. Written by Juergen Landmann: Tag 17 besteht in der Aklimatisation. Unsere einzige Arbeit heute besteht im Bau einer fuer diese Verhaeltnisse Drei-Sterne-Toilette.Immer wieder schuettelt uns der Sturm durch, schliesslich ist das Lager wie ein Adlerhorst in einer recht kleinen und noch dazu abschuessigen Eisattelung gelegen. Am Morgen von Tag 18 brechen wir die Zelte erneut ab und beginnen den Aufstieg zu Camp 1.5, ein spannender Weg, weil ueber einen etwa 80m hohen Serac-Abbruch fuehrend. Der Abschnitt ist zwar mir Seilen versichert, aber erfordertdennoch volle Konzentration und technisches Koenne im Eisklettern. Das auf einem ca. 100x100m grossen Plateau gelegenen Camp 1.5 erreichen wir gegen 17.00, sofort bauen wir die Zelte auf, was einen in einer Hoehe von 6700m ganz schoen den Schnauf ausgehen laesst. Monday 16 September - Rest day in Camp 1 The group spent most of the day acclimatizing to this new altitude of 6400 metres, 21,000 feet, a height record for some of the members of the expedition. Camp 1 is a beautiful camp with the tents set up on a series of ridges with astounding views of Cho Oyu and the surrounding mountains. Some of the members saw a large avalanche on the South-west side of the mountain. Camp 1 with Mount Cho Oyu in the background. The route to camp 1.5 follows the left hand ridge. JJ Photo. James and JJ build a toilet from snow in camp 1. Photo by Matti Sunell. Our Cho Oyu team reached 6400 m / 21,000 ft in beautiful sunshine. Let the rope fixing begin! Sunday 15 Sept - half camp to camp 1. This morning we woke up to good weather and we debated staying at half camp or moving to camp 1. It was not long before we decided to move up the hill to camp 1. The hill from half camp to camp 1 has a famously very loose stone base, this hill has gained it's reputation as "horrible hill" very well. It takes a couple hours to move up the hill before reaching camp 1. Camp 1 is the first camp that is on snow. We quickly set-up tents and made food and drinks for the night, while our Sherpas went off to fix rope higher on the route. It is considerably colder here, but it can also be very warm if the sun is shining. A few of us are feeling the altitude, but overall the group is doing great. Written by JJ, from the Netherlands. Moon rises over the shoulder of mighty Mount Cho Oyu. Photo by JJ. Mysterious ice pinnacles and fog on the trail between ABC and camp half. JJ Photo. The weather was clear enough today for us to move to camp 1/2. 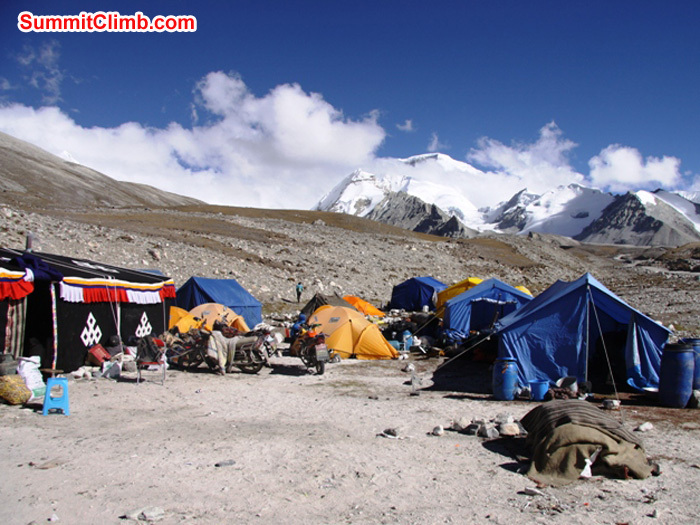 This camp is situated right below the infamous “horrible hill” at 6000 meters / 20,000 feet. The trek to half camp was quick and easy movement over scree and talus moraine. Once we reached half camp we rested and set up camp. The day went by quickly. It felt good to be on the move again. Written by JJ, from the Netherlands. 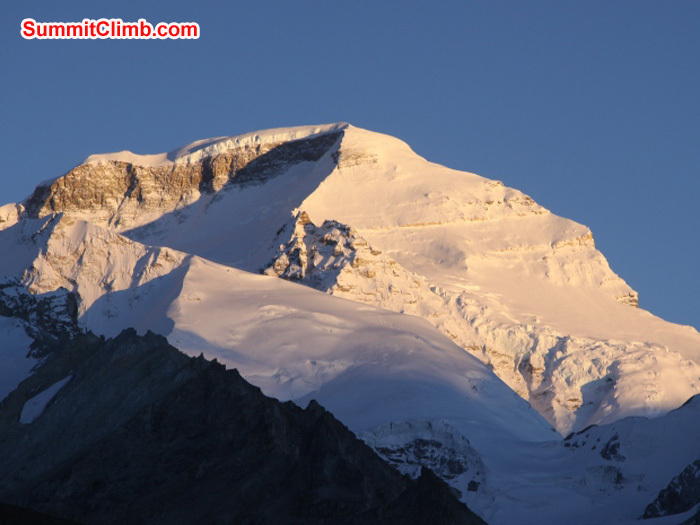 Today we all assembled early morning and prepared for the "PUJA", the blessing of our climb that was to come and also the blessing of all of our equipment, such as boots, helmets, crampons, ice axes, harness and so on. 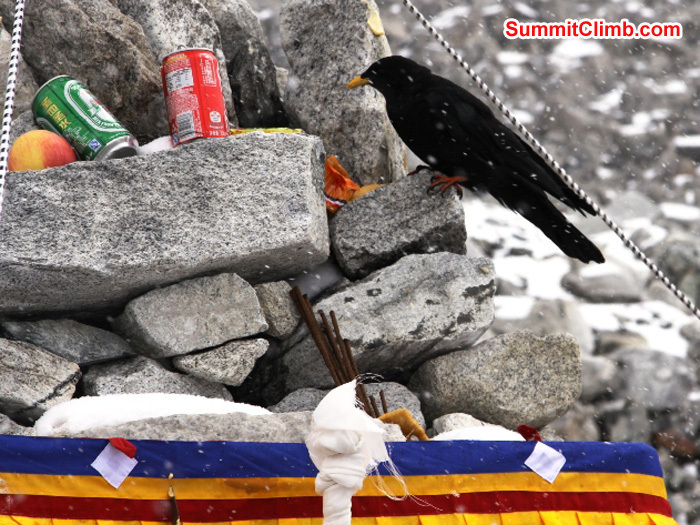 All of the climbers were invited to sit facing the ceremonial alter and share in the blessing ceremony, which had food and drink as an offering to the gods, (see photos), near the Altar, to be shared by ourselves the climbing party and the gods. There were also helpful attendants who prepared the prayer flags and assisted as the prayers were read aloud. We were given rice and offered to throw this towards the ceremonial altar at certain times, in a way of showing our gratitude to the gods that they may see us safely through our climbing expedition. Our equipment was also blessed and some yak butter was used to do this, by the helpers as the prayers were still read aloud. We were also given a variety of food and drink to be shared by ourselves and the gods, therefore some of the food and drink was thrown onto the ceremonial altar. Then as it started to snow very lightly we were entertained further by the local Tingri porters that would carry our equipment to camp 1, they produced a native dance and song routine that was very special and most welcome. All in all I can say that I was humbled by this holy experience and found great solitude in the fact that we had this blessing before our expedition. Ang Pasang looks at whats cooking in our dining tent. James Grieve Photo. 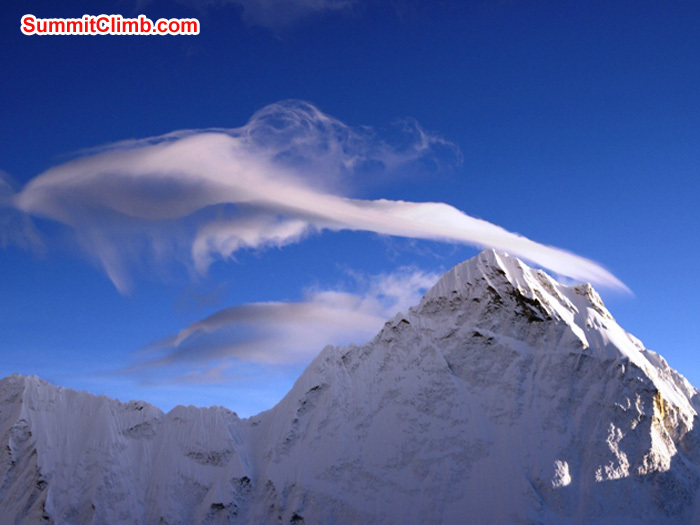 Crazy clouds hover above an unnamed 6000 metre peak in ABC. Matti Sunnell Photo. Local Tibetan dancers at the Puja ceremony. James Grieve Photo. Puja blessing ceremony in advanced basecamp during a snow storm. Climbing gear gets blessed too. Thats Jangbu Sherpa sitting beside the Lama and Dan. Ang Pasang Photo. Written by Matt Olsen in English Language: Today was a fun day of rope skills. We ventured across icy glacial moraines to some ice pinnacles on the glacier. Some ropes were set-up and we practiced fixed rope and rappelling techniques. Last night it had snowed a couple of centimeters, but this almost added to the good day that we had. We learned some of the key skills we will need up higher on the mountain. It is a good idea to practice it down lower, because then it will not be new thousands of meters higher than we are now. 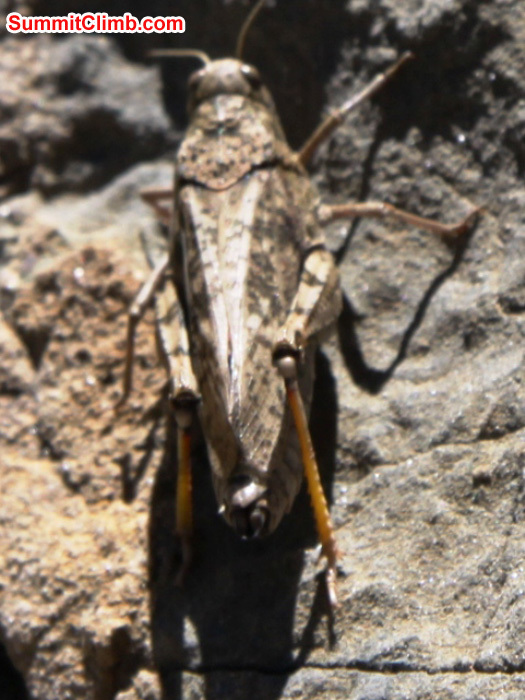 What was somewhat challenging for the not-so-experienced among us was rappelling at 60 degrees and encountering a knot, which entails securing yourself on the jumar while you re-attach the eight to the rope. Tricky stuff but a lot of fun! 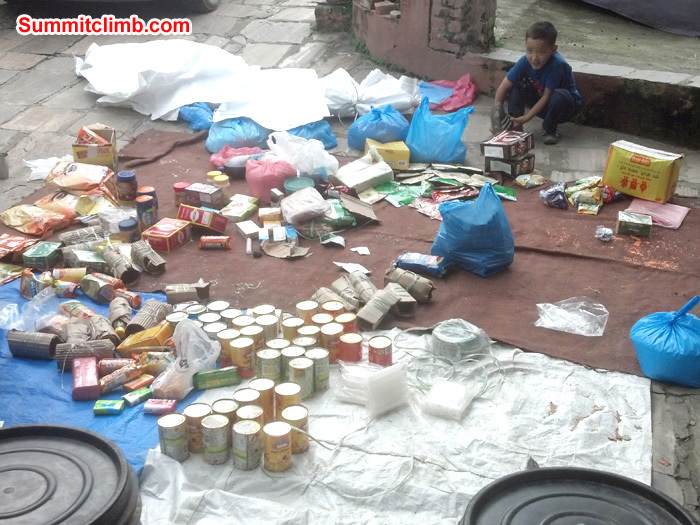 As usual, we were impressed by the skills of our Sherpa team, Jangbu and Ang Pasang. 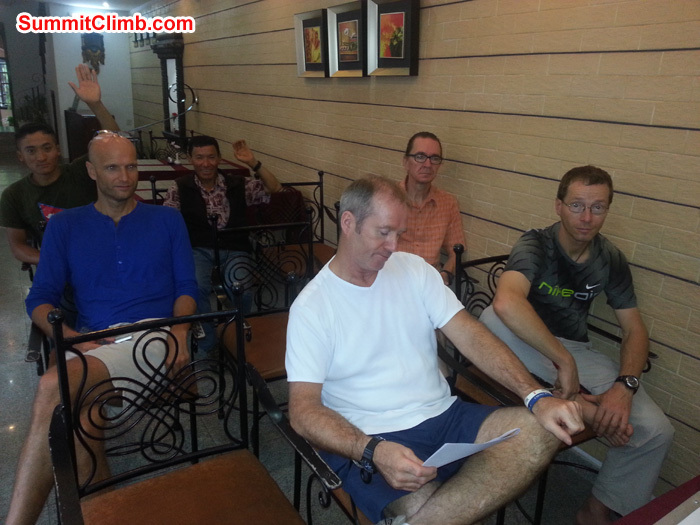 Overall, we feel this training has increased our self-confidence for the more tricky parts after the high camps. Written by Juergen Landmann in German Languge: Ein weiters mal habe ich echt gut geschlafen. Heute, hier im Interiem-Camp bekomme ich zum ersten Mal meinen Guten Morgen Tee ins Zelt serviert. Die Wolken haengen tief und die Yaktreiber feilschen und streiten um die ins ABC zu bringenden Lasten. In 6h marschieren wir in unser neues Lager auf 6505m. Wir richten uns in einem weitlaufig verstreitem Blockgelaende bestmoeglich ein, schliesslich wird das unser Zuhause fuer einige Wochen sein. Tag 12 bringt nicht viel zu tun, wir sortieren die Ausruestungen, versuchen eine Art Ordnung in die Zelte zu bringen und geben dem Koerper einfach Zeit, sich an die nicht unwesentliche Hoehe zu gewoehnen. Immer wieder mehr als erstaunlich ist, was unser Koch Dorje und sein Kuechen-Boy Jimmy so alles zaubern. Es fehlt echt an nichts, wir werden bestens und vielfaeltig versorgt. Abends hat es dann erstmals richtig angefangen zu schneien. Etwa alle 10 min musste der schwere Schnee von unseren Kuppelzelten geschuettelt werden. Tag 13 diente dem Training und vermutlich dem Check unseres Koennens. Wir stapften durch das Gewirr von Eisbloecken, Steinen und gefrorenen Seen zu einem mitten im Eisbruch gelegenen etwa 15m hohen massiven Eisblock. Hier konnten wir klettern abseilen und uns so richtig austoben. Ich denke, alle sind fit genug, morgen weiter aufzusteigen und moeglich jede der kommenden Naechte ein Lager hoeher zu schlafen. Auf die Puja freue ich mich richtig. Ist immer wieder erhebend, bei einem solchen Ritual eingebunden zu sein. Panoramic photo of ABC by JJ. JJ climbs the ice pinnacle near basecamp during team ice training, Photo by Matt Olsen. Juergen climbs, Jangbu observes. Ang Pasang Sherpa Photo. Matt and Juergen discuss abeil technique. Jangbu Sherpa Photo. Putting on gear at ice training session in ABC. Matti Sunell Photo. ABC after a snowstorm. Matti Sunell photo. Chimi prepares a delicious lunch after a hard day on the ice. Photo by Ang Pasang Sherpa. James and Dan roping up while JJ and Matti look on. 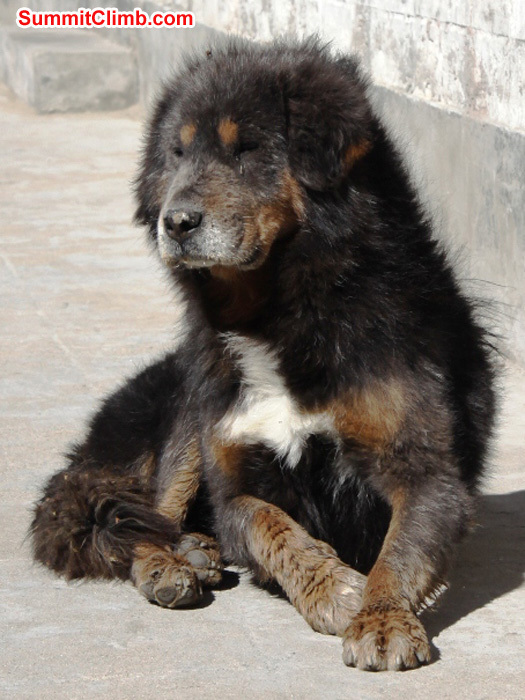 Jangbu Sherpa. James climbs towards the camera as JJ abseils.Juergen Landmann Photo. James Grieve concentrates on his abseil during ice training in ABC. Jangbu Sherpa Photo. 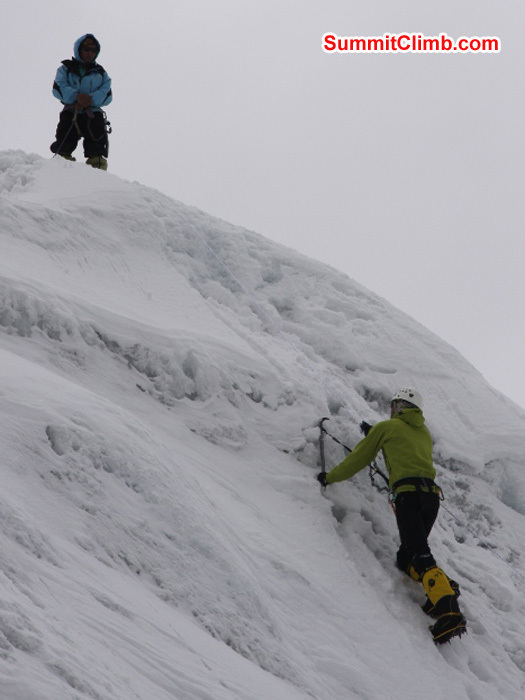 JJ climbs ice while Jangbu Sherpa instructs during ice trainng in ABC. Matti Sunell Photo. Matt Olsen, Outward Bound Instructor, shows off his pink zinc oxide. Photo by JJ. Our team doing ice training near ABC. Photo by JJ. Cho Oyu in evening light with cloud. Matti Sunell Photo. 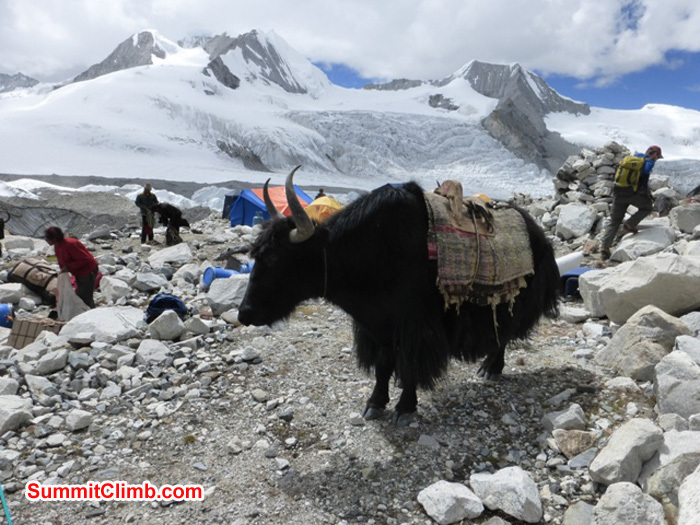 A just unloaded yak in abc with lots of abc setting up activity going on all around. Juergen Landmann Photo. Advanced Basecamp seen from above. Matti Sunell Photo. 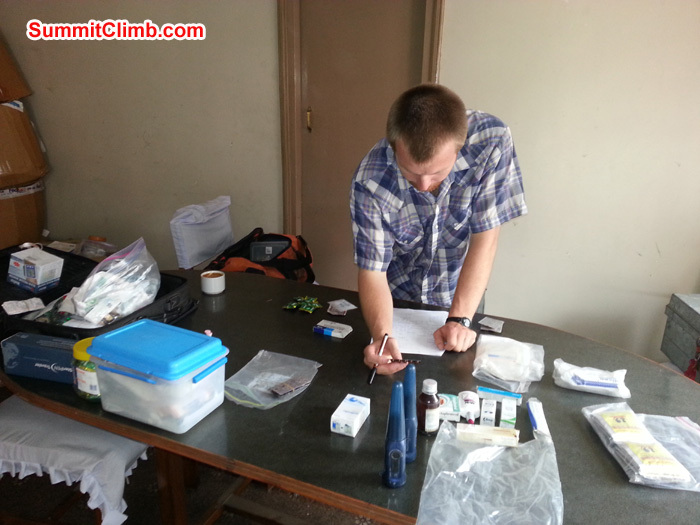 Dan and Matti sorting out their equipment in abc, with cho oyu in the background. Juergen Landmann Photo. 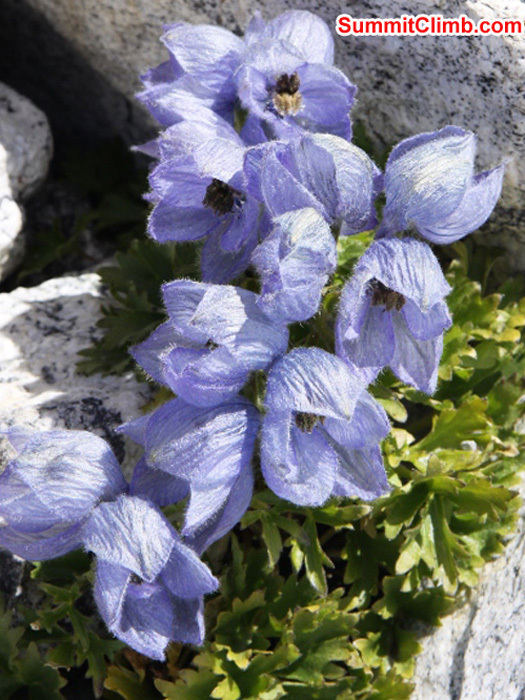 Glacier flowers near ABC. Matti Sunell Photo. Glacier Lake beneath a hanging icefall, across from ABC. Matti Sunell Photo. Jangbu, james, jj, juergen, and matt taking a break along the jeep track walk to abc. Matti Sunell Photo. JJ and Dan fit a crampon to a boot in ABC. Matti Sunel Photo. Juergen Landmann shows his flag in ABC, with Cho Oyu in background. Matti Sunell Photo. Tents in ABC, with Matt in background. Matti Sunell Photo. 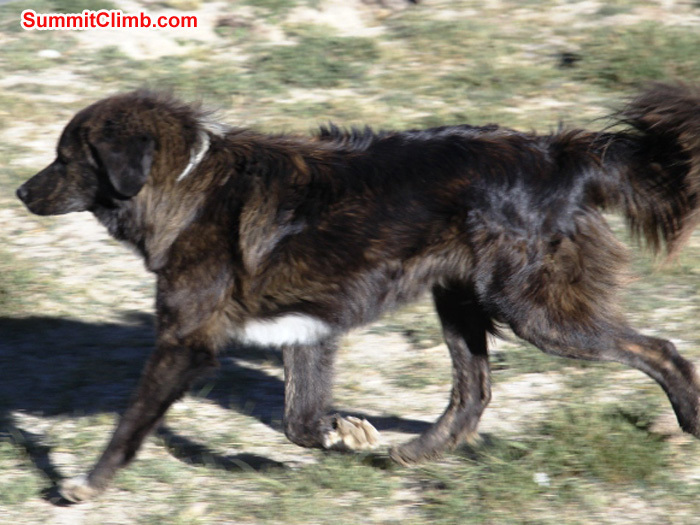 Today our team of 7 members, 3 Sherpas, and 1 Tibetan reached Gyepla at 5350 metres / 17,500 feet. It was a gorgeous walk through rocky river valleys and turbulent glacier moraines. The winds were calm as the warm sun beamed down on us through clouds as we walked the 3.5 hours on a jeep track into the short grass - rocky valley of Gyepla, where a small community of Tibetan teahouses and western mountaineering tents has sprung up. Our little team was accompanied by 25 yaks and 1 large noisy Japanese cargo truck. 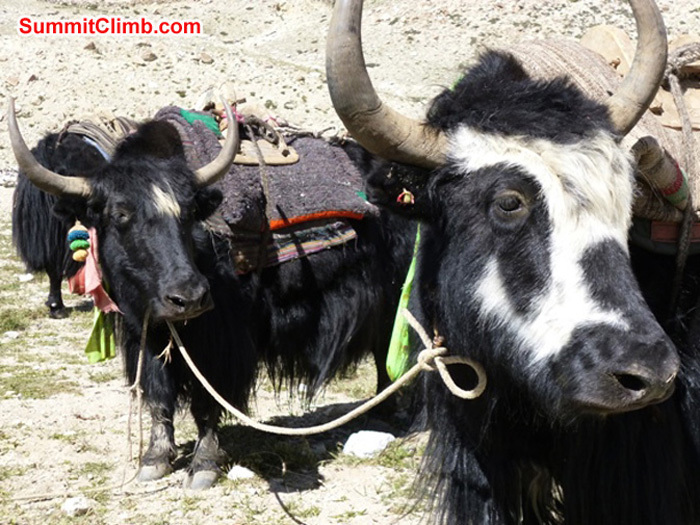 The yaks went empty, and the roaring truck was bursting with gear and people. 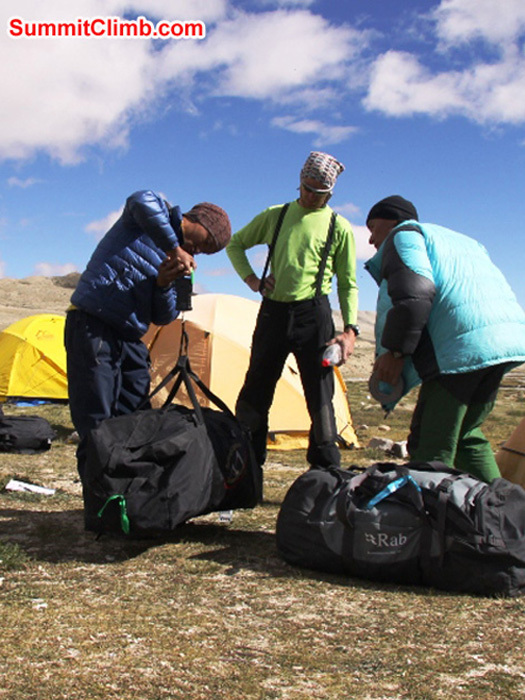 Upon arrival in Gyepla, many kind Sherpas came out to help us set up camp. Such gentlemen! We dove into the exotic carpet and cushion lined teahouse tent for a comfortable cup of tea, enjoying a hot drink while perched upon plush sofas around the warm yak dung stove. When we first arrived here in Gyepla, the small valley stream was dry as a bone, then in the late afternoon, it turned into a burbling brook. Finally, as we sat in our team's own dining tent and enjoyed a delicious evening meal of veggies, pasta, soup, papadum, and mango slices, with loads of hot drinks, the sun popped out over Cho Oyu, known by the Tibetans as the "Turquoise Goddess", and the world's sixth highest mountain was draped in golden light, against a brilliant bluesky backdrop. Tomorrow we will quest for the next higher camp. Wish us well! Matti Sunell from Finland writes in: After sorting our things into two separate bags, one going directly to the advanced base camp and the other containing equipment we would need in the interim camp, we packed our backpacks very light and started the walk up the road towards the interim camp. The big bags would come by truck. The easy road followed the valley floor near the river, and after about one hour's walk, started winding up the hills of the glacier moraine. We took it easy, but made good progress. Near the interim camp the truck carrying the expedition's equipment and our bags reached us and we were offered a ride, but we decided to walk the rest couple of kilometres because we felt strong. The iterim camp's field was packed, as there were many expeditions arriving at the same time. As usual, the day ended in a comfortable and crowded teahouse. Gyepla camp. Teahouse on left, dining tent on right, Cho Oyu in the distance. Matti Sunell Photo. Juergen Landmann hitches a ride in a Japanese cargo truck while Hapa, the driver, sips a red bull. Dan Mazur Photo. Chinese fil crew makes a television program in Gyepla. Matti Sunell Photo. James, JJ, and Matt walking along the jeep track to Gyepla. Matti Sunell Photo. Today, each of us separated our equipment into two duffles: things that we will not need until Advanced Base Camp in one duffle and things that we may want before then into another duffle. Tomorrow we will be going to Intermediate Camp and staying there a couple days before going to Advanced Base Camp. After, we sorted gear. Most of us went on a stroll and hiked up a "hill" to the south-west of camp. 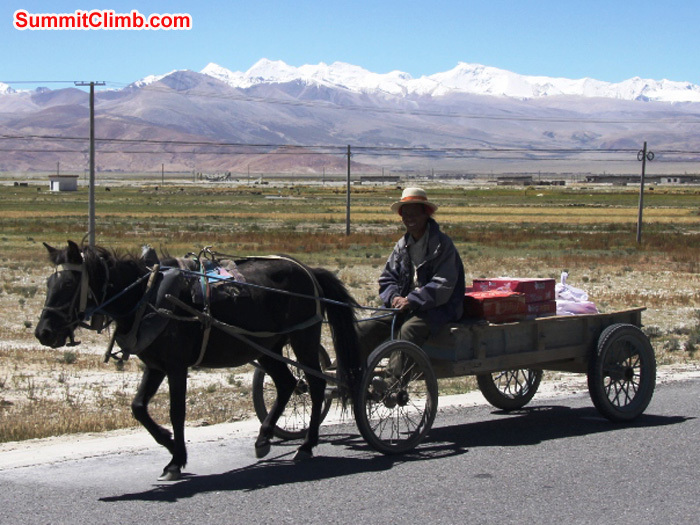 Half the group decided that walking to 5200m / 17,000 feet was good acclimatizing and returned back to Chinese Base Camp. Three team members decided they wanted to go to the top, so they continued their adventure up the slope to the top at 5400m / 17,700 feet. The three adventurous members imagined an easy hike up to the top of the hill, but ended up scrambling on rocks and loose scree. 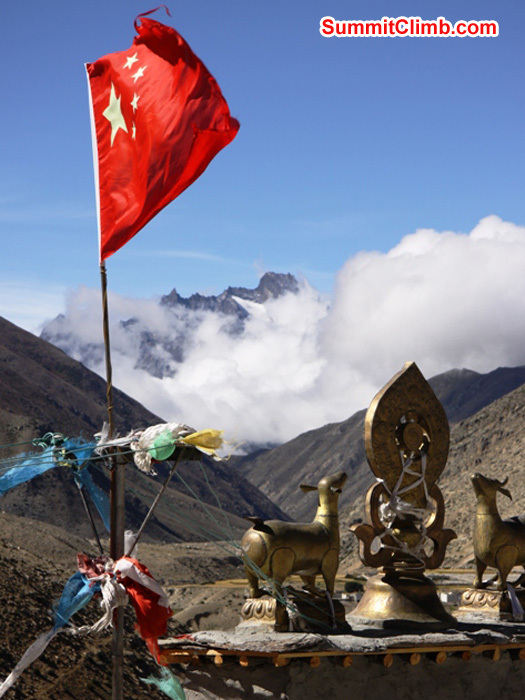 However, we finally reached the top and had excellent views of Cho Oyu, the surrounding mountains and the mysteriously-coloured Tibetan plains. We could see almost the whole walking route along the Gyabrag glacier moraine to the intermediate camp and the advanced base camp. We met members of another expedition on the top and began running down the hill together. Then everyone returned to Chinese Base Camp to have an excellent lunch. This afternoon many of us are going to relax a little, maybe journal about the amazing time we are having in the dining tent, a tent specially set up for the team members to eat in, charge batteries, and chill. Loading a truck photo by Matti Sunell. Eagle above Cho Oyu photo by matt olsen. We woke early and had breakfast at 8am, then we started our journey to Cho Oyu base camp a little earlier than normal since the vehicles that we were using were needed to bring personnel from Cho Oyu base camp for medical purposes. We had another wonderful day, very beautiful and very sunny, hopefully a good omen from the turquoise goddess for our future expedition ahead. As we set off on our short journey of between 45 minutes to 1 hour on a nice road for a base camp access, we could see Cho Oyu imposing as it was is in the distance, very clear and very beautiful, standing so excitingly close, almost as though we could climb there today. After many photographs on our way to base camp, and passing a few motorcycles driven by local Tibetan people, we arrived at Chinese base camp at an altitude of 4900 metres / 16,000 feet, full of anticipation and excitement. We duly proceeded to unload our backpacks and assist where possible with the setting up of our camp, (home for the next 2 days). The shower room, and the dinning and cooking areas had already been completed by our wonderful Sherpa's, about whom we cannot say too much, these Sherpa's are so dedicated and friendly that maybe without them none of this could be possible. We then took our large bags and unpacked these in our tents and familiarized ourselves with our new homes. After setting up camp, we had a very nourishing meal, again prepared by our skillful cooks. We then wondered around our new surroundings and made some new friends, the Chinese team being particularly hospitable. After a few beers and some climbing stories we departed, warmed by the new friendships that we had made. All of our day today was purely based upon acclimatization, since we had moved from an altitude of 4300 meters / 14,000 feet to a new altitude of 4900 meters / 16,000 feet. Not much you may say but believe me, it takes time to adjust to these new heights. We therefore only did a very short hike in the direction of advanced base camp to 5200 meters / 17,000 feet to stimulate acclimatization. Slowly but surely we are moving gradually higher in a safe fashion, eating well, sleeping well and getting used to these new soaring heights. We all had dinner together once more and shared stories of the trip thus far and also of the adventures still to come. Juergen Landmann tops out on a 5600 metre high hill above basecamp. Photo by Matt Olsen. Matt Olsen and Dawa in the dining room in Tingri. Photo by James Grieve. The great Buddhist saint, Milarepa, taught that all life, be it human or animal, should be respected and cherished, and that man should live in harmony with nature. destination) from here. The surrounding plateau at the base of the big mountains is very green, with abundant water flowing. We saw quite few ducks wading in ponds during our walk around dusty Tingri yesterday. 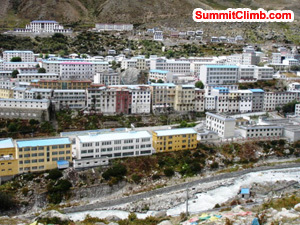 This town is a trading center for the Everest region. 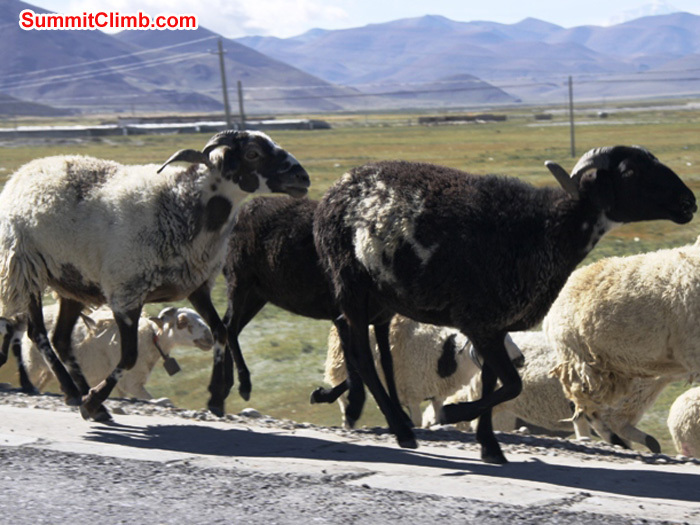 Groups of nomads wander the streets trying to sell fat sheep. Kids skip along the road to and from school. Shopkeepers load and unload piles of boxes, tools, ropes, food. The chugging sound of one cylinder diesel tractors echoes up and down the street as horse carts trot by. 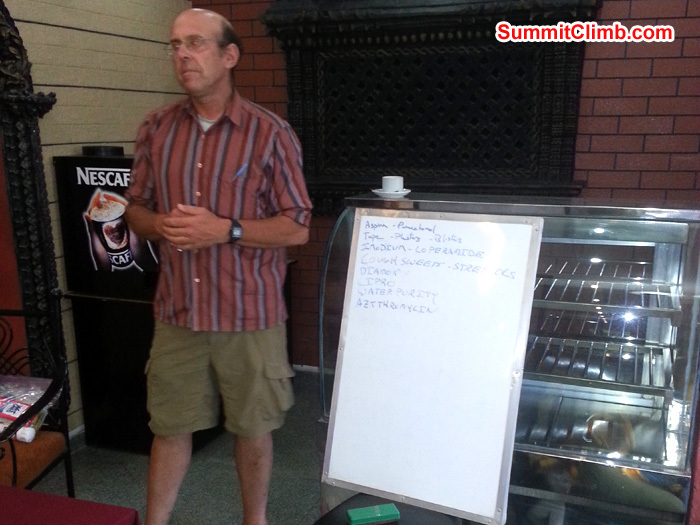 While having breakfast of pancakes and eggs the team discussed the destination of todey's acclimatisation hike. We decided to walk up a brown hill outside Tingri. Dogs from the villages often follow walkers high up to the hills, but unfortunately we were left without their company this time. 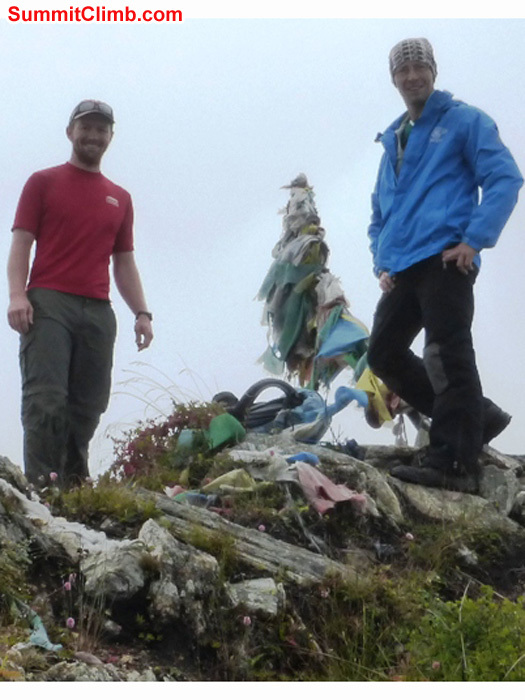 Walking up some 400 metres on gentle scree slopes brought us to the top decorated with prayer flags. Under a clear blue sky we had excellent views over Everest, Cho Oyu and the Tibetan plateau with its fields in countless shades of green. James Grieve spinning prayer wheels in Tingri. 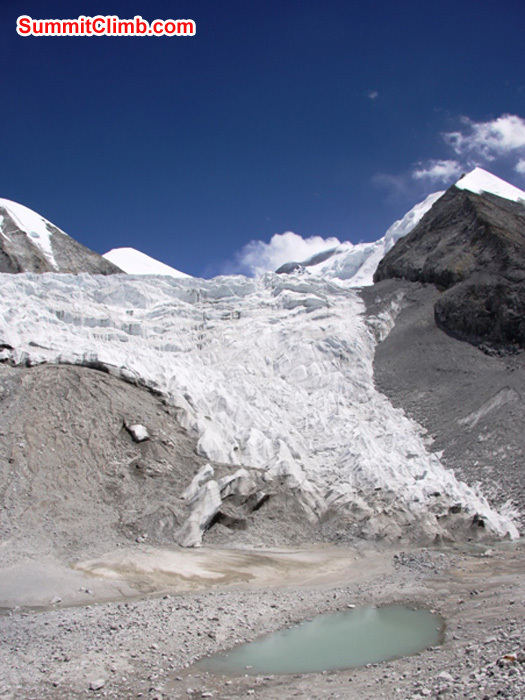 Wild Tingri ducks in front of Cho Oyu. Juergen Landmann Photo. Milarepa's Cave prayer hall. Matti Sunell Photo. Sheep herding in Tingri. Matti Sunell Photo. We visited the Milarepa cave on our journey towards Tingri. Milarepa was a Buddhist Saint instrumental in bringing Budhhism to Tibet. As he arrived to the country he settled in a cave (we had the honour to visit the tiny cave) that later became a monastry. Much to our delight, a young monk showed us around the entire monastery. Today the weather was on our side. The skies were crystal clear with a little bit of cloud cover far on the horizon. After about a half hour's drive from Milarepa's monastry and cave Shisha Pangma appeared in all its magnificent beauty. We had ample opportunity to admire the mountain from Yakri Shong La at 5050 metres. Not long after this spectacle, Cho Oyu, and the smaller mountains in the range imposed on us with no cloud cover and not a bit of wind on the respective summits. The mountains stayed with us as we made our way to Tingri, where we checked in at the Ha Hoo hotel. We enjoyed a great lunch and went for a short walk to Qomolangma viewpoint, build on the remains of an ancient fort on top of the old Tingri town. 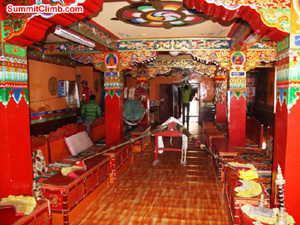 Dan guided us through this typical Tibetan town with all its narrow and little streets. The food we have enjoyed during our journey has been delicious and very appetising, we have consumed very healthy vegetables, meats, rice, etc. Of course during all of our dining experience we have use the traditional chop stick, very easy for some to use and very funny to be seen used by others as well,even Matti has managed to become a graded apprentice in the use of chop stick. Shishapangma seen from the Yakri Shong La. Photo by Matt. Tingri, a town with one main street. James Grieve Photo. Today we rested and acclimated in Nyalam, hiked around on the hills, hung out in teashops, and read books. Today we drove to Kodari for breakfast, crossed the Friendship Bridge, cleared Tibetan customs and immmigration, drove to Zhangmu for lunch, and Nyalam for dinner. 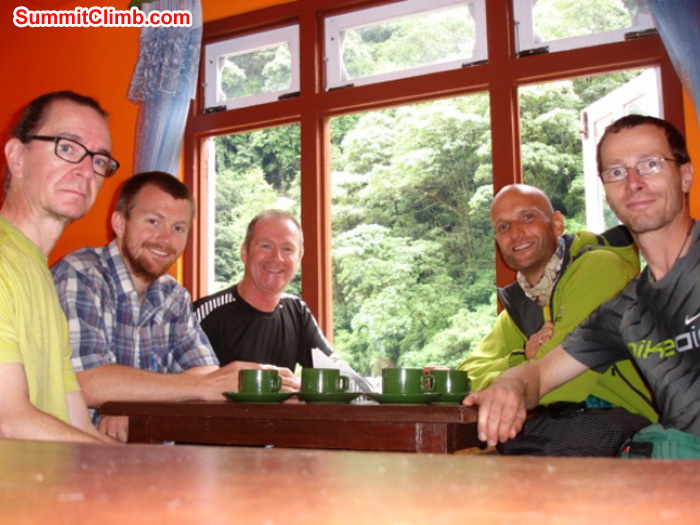 JJ, matt, matti, jurgen,after crossing the nepal tibet border,photo by james grieve. Today we finalized all formalities for the Chinese visa application. Contrary to our expectations, we did not get an individual visa, only one paper serving as a group visa. After the visa process we moved onto our team orientation and briefing which was a very informative and helpful affair, lots of team building involved here. We were shown the equipment to be taken on our trip to base camp,paying particular attention to safety and medical equipment,making sure that each member understood everything that was required to be carried in their bags and how the medicines were to be used and further information on the meds were also made readily available to everyone. Considerable attention was made to the medicine called Diamox and it's qualities and possible side effects, with each member given there own choice whether to use Diamox or not. Today was a very busy day. 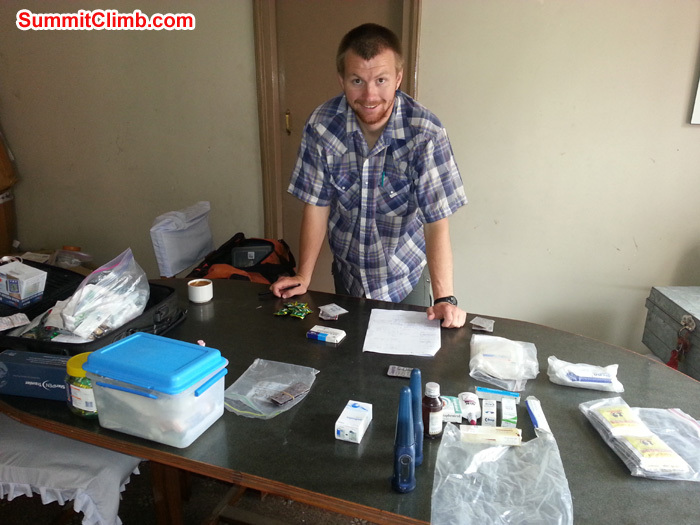 We woke up early and made the medical kits for the team. Along with The Mount Everest Foundation for Sustainable Development we planned renovations for the Deboche Monasteryunt. In addition we met with Miss Elizabeth Hawley, Himalayan Chronicler. She is a historian for the Himalayas and records major events for the area. Everyone on the team has finally flown into Kathmandu! We are excited to get on the road! We have been busy packing and are almost all done with all of the group gear. This includes the tents, kitchen and dining tents, solar panels and lots of food. 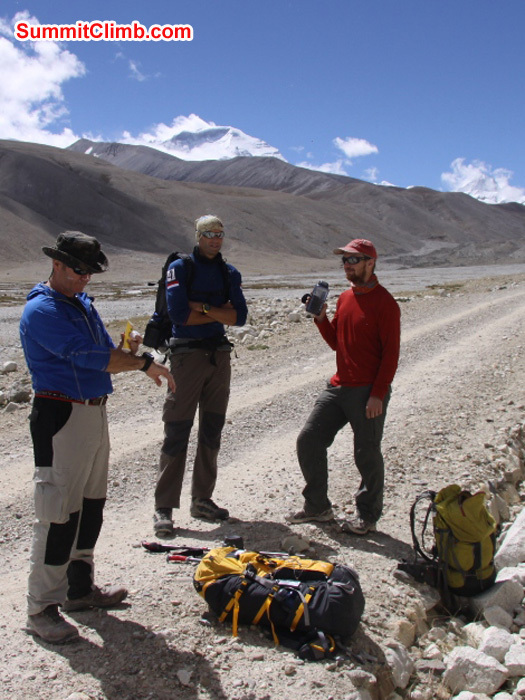 The team is arriving and we will be on our way to Cho Oyu within a few days. The Swayambhunath: Stupa (also called 'Monkey Temple') is not far from us in Kathmandu. We are very excited to get to the mountain!